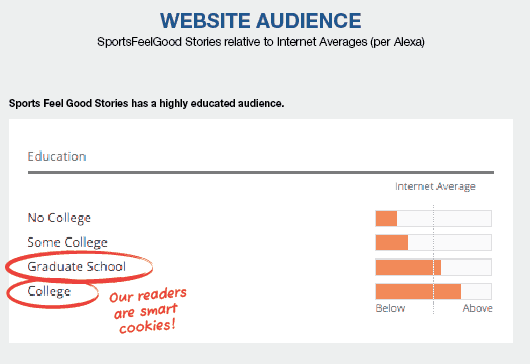 SportsFeelGoodStories.com offers advertising opportunities and selective sponsorship opportunities. For advertising opportunities, it usually works best to connect with our ad network: Adthrive. For sponsorship opportunities including sponsored posts, product placement, contests, etc., please contact the publisher via the Contact Us page. A high schooler overcomes 70+ surgeries to win the highest athletic honor in his city, a 98 year-old nun is the spiritual leader of her college’s basketball team surging in the NCAA tournament, and a NFL prospect wows scouts by bench pressing 225 pounds 20 times — one-handed! Nine years ago, SportsFeelGoodStories.com set out to capture these types of inspirational stories. Upon reading them, we’re sometimes reminded of why we were attracted to sports in the first place and walk away feeling a little better about things. 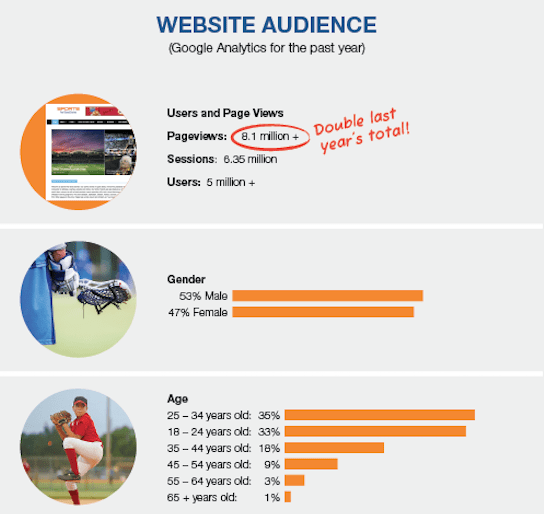 In the past year, page views more than doubled to over 8 million and continue to rise. It’s not just sports fans that are attracted to an inspirational story. Business people, teachers and leaders from all walks of life use these messages to relate, motivate and inspire. If you’re looking for an opportunity to partner with a family friendly, uplifting site, we hope you’ll be inspired to work with us. We partner with companies that fit with our family-friendly, inspirational content. With great partnerships, the whole can be greater than the sum of its individual parts. We’re very open to working out the type of program that addresses meaningful client objectives. We’re in it for win-wins and long-term partnerships. 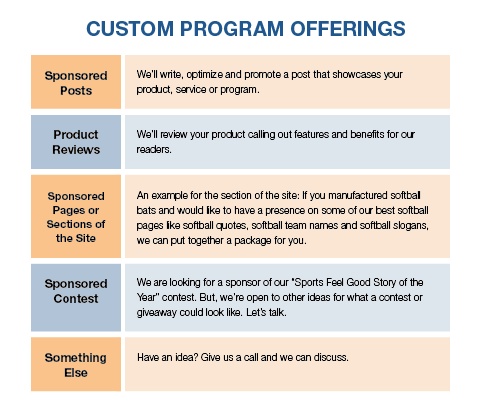 Here are a few ways the sponsorship opportunities could work. TeamSnap: SportsFeelGoodStories.com partnered with TeamSnap, the #1 sports team management app, to co-sponsor the “Sports Feel Good Story of the Year.” Readers submitted stories, and the winning entry was submitted by nine year-old Hollis Bergis who raised $32,000 to fight cancer by juggling a soccer ball and reaching out to donors. Canada Goose: SportsFeelGoodStories.com partnered with Canada Goose on a featured post on “How to Stay Warm at a Football Game.” The article earned a featured snippet on Google and the first ranking. If you’re interested in finding out more, including receiving a media kit, please use the form on the Contact Us page. In the message section, please be clear as to who you are, who you represent, and what you’re interested in. Thanks.